A stunningly clean and bright set of halls where you can hear from college age soldiers in maroon sweaters all about Egypt’s 20th century wars,; 1973, 1956, 1948. The 1967 war is absent. Port Said is famous for its resistance against the British and French in 1956, and the tour guides will tell you with gusto about men hiding grenades in sandwiches and losing their eyes at the hand of Hannibal Lecter-esque doctors. 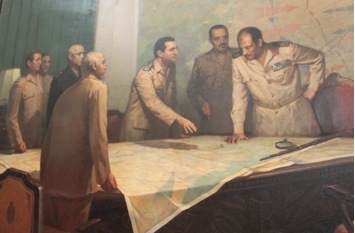 Keep an eye out for a painting from the 1973 war depicting two Mubaraks in the same room. There’s also a dog on site named Rommel, after the German General. I’ve written a bit about Egypt’s military kitsch here.